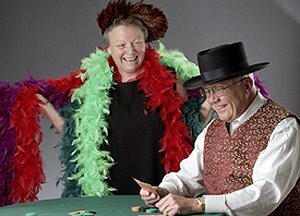 Know when to hold 'em, know when to fold 'em: Elaine Perilla, chair of the Johnson County Community College Board of Trustees, and Charles Carlsen, former college president, enjoy the lawlessness of the old west in a media photo for the college's 2005 Dollars for Scholars fundraiser. Carlsen voluntarily retired following allegations of sexual harassment. 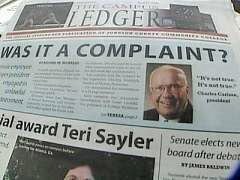 Perilla, implicated in the cover-up, remains board chair.